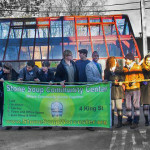 This project encompasses creating a year-round selfsustainable urban food production system inside a bioshelter located on an abandoned lot in Worcester’s Piedmont neighborhood. Green energy, compost, and rainwater were considered as alternatives to fossil fuels. This project is a collaboration between Worcester Common Ground, WPI and other community organizations to revitalize a blighted property and tranform it into a productive community asset. Construction of the bioshelter is slated for spring 2016.